We awoke in Cheyenne to an 'interesting' risk for severe storms in the interior of WY. Moisture was pooling on the west side of the Laramie Range, along with clearing skies and a fairly strong northeasterly surface wind. To kill time prior to convective initiation, we visited the Snowy Range Pass (~11,000 ft. elevation) where plenty of snow was still to be found. After stopping for some neat shots near Lake Marie in the Snowy Range Pass, we completed the circuit and watched developing convection near Rawlins, WY from the Elk Mountain, WY area. The convection was ‘pretty’, but never really had a tornadic appearance. However, when driving east away from these storms on HWY 72 near Rock River, the storm suddenly pulsed up an started to feature a cone shape lowering now 15-20 miles to our west near Elk Mountain. We stopped at a nice vista east of Rock River to watch the developing tornado. The tornado started around 3:47 local time and was nearly continuous until 4:03 PM. A second, smaller, rope tornado also formed around 3:53 PM just to the northeast of this first tornado. These tornadoes were rather unexpected, and after further analysis, likely formed due to a local vorticity maximum associated with strong northeasterly winds into the area (see image below). A storm-scale boundary may have also played a role in tornadogenesis, as these storms were a ‘one and done’. A fun and rather unexpected high-plains surprise! MISC: Overnighted in Laramie, WY. This is currently my highest recorded elevation of a tornado. 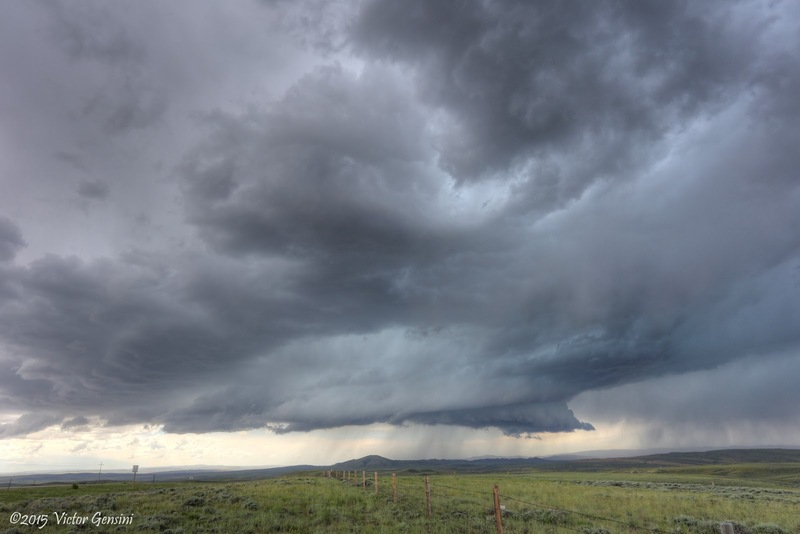 We estimate that the Elk Mountain, WY tornado occurred at an altitude of 7,300 ft. ASL! Surface obs, visible satellite, and vorticity (tan contours). Green 'x' is our location.